Are Seiko automatic watches any good? Do automatic watches stop if not worn? 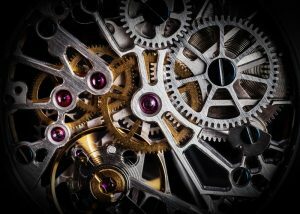 Does automatic watch movement make noise? The most frustrating problem for watch buyers is that it’s so difficult to find the perfect timepiece for their style along with its reliability & price.If your taste runs into automatic watches, things are even more complicated. There’re lots of aspects that you must consider carefully before making the purchase. This list consists of the best automatic watches under $500 with various styles catering to different tastes.These are also bestselling models chosen from hundreds of customer feedbacks through watch blogs and forums, making sure that the best is presented. Check Price at Amazon Now! Starting the list is a great automatic dive watch from Seiko. SKX173 is moderately-priced and is the best in this category for its looks, features, and overall functionality. The design of this dive watch is simple and sporty, combining the complicated functions of the dive watch and the simplicity of its looks. It has two distinct colors setting its tone in the form of a stainless steel case and a black synthetic band. This design easily fits most styles and can be used in most informal occasions. The 21-jewel timepiece has an easily-recognizable black dial with markers for quick glances. These markers are powered by Seiko’s LumiBrite technology, offering a strong, bright, and safe light. For its protection, a durable Hardlex crystal covers its dial. If you live an active lifestyle, especially if you are a diver, then this timepiece is exactly for you. The Seiko SKX173 fits perfectly for those who like outdoor sports and prefer a simple, yet rugged look for a timepiece. Its color scheme of black and white is simple and fitting for most outfits as well. The timepiece provides durability and reliability inside a simple design. As a dive watch under $500, it definitely provides a great addition for your collection for its features and look. With this, the SKX173 is our choice for the best diving watch under $500. Bringing to life one of Seiko’s timeless classics, the SRP777 Prospex is another choice for the best automatic dive watches under $500. It is a charming sporty watch that many enthusiasts recognize. Built as a successor to the famous Seiko 6309-7040 dive watch, this timepiece retains the character and adds a few more additions in order to further improve the potential of the watch. The design of the SRP777 Prospex features a sporty and classic look. The bulkiness it exudes and the classic nostalgia of the 6309 makes it quite a catch for active people and enthusiasts alike. It complements most outfits as well with its simple color scheme from the stainless steel case and rubber band that it is usually paired with, although you may change this to any strap you prefer. The 25-jewel movement of the SRP777 ensures good quality timekeeping especially on long trips. This timepiece is quite large, but still fits nicely for people with moderately-sized wrists. The black dial features markers for the time and includes a day/date function at the 3 o’clock mark. It is also powered by Seiko’s LumiBrite technology, protected by Hardlex crystal. The Seiko SRP777 Prospex is an ideal timepiece for diving, outdoor sports, and most occasions you opt to bring it to. Because of its simple and classic look, it can be worn on any trip you’d like. If you are a sporty individual or a fan of this design, it is a great choice for an under $500 automatic watch. This watch combines simplicity and a classic heritage look from the 6309 model. This makes it a great choice for an all-around timepiece, adding on its diving capabilities. All of these lie on a watch that’s just under $500, which is why it was chosen as one of the best diving automatic timepieces in this list. A dress watch begging to be worn, the SARB017 Alpinist from Seiko is a timepiece worth bringing to special occasions, and even on informal ones. It boasts a uniquely attractive radiant green dial and golden hour marks, a very uncommon design for watches. This brings out a beautiful and well-made timepiece that ensures both first-timers and watch enthusiasts would definitely love it. The design of the SARB017 Alpinist is very classy which makes it an extremely wearable watch. The color combination of green through the dial and brown through its strap matches very well. What makes it great choice is that it doesn’t choose a specific target audience and can easily be worn by all. Its size is also moderate, not too big and not too small. It’s not very bulky, and leans on the thinner side of timepiece sizes. It can be worn as an outdoor timepiece with its features, or as an event timepiece on informal and special gatherings. It has a good quality 23-jewel movement for keeping accurate time. A 50-hour power reserve lets it stay wound up properly when not in use, giving you time before it needs wounding again. There is a day/date function at the 3 o’clock mark as well. A unique and useful feature is that it has an interior bezel which can be used as a compass when utilized correctly. For its protection, a Synthetic Sapphire crystal is used. Combining elegance and dress-worthiness, the SARB017 Alpinist is an excellent choice if you want a timepiece that looks unique and can be brought on almost any trips you prefer. The color combination makes it fit any style you want without sacrificing its own character. Meant as a timepiece for both outdoor travelling and social events, it is a great dress watch well worth its less than $500 price tag. You can be assured that Seiko’s craft introduces great character, function, and uniqueness combined into this single timepiece. Opt more for a sleek and simple timepiece? Seiko’s SARB035 fills this need. Exuding luxury in this budget-friendly watch, it is definitely dress-worthy and can be brought to a lot of informal and formal occasions when the need arise. The design is relatively straight-forward with the Seiko SARB035. With a stainless steel bracelet and case, it gives justice to its dressiness. The creamy white dial complements the stainless steel perfectly, adding a luxurious character to the silvery look of the watch. It is a moderately-sized timepiece, fit for most wrist sizes. It’s also thin and light compared to what it looks like. At the back of the case is a transparent glass which features the interior machinations of the timepiece, a classy addition to its already sleek look. It features the 6R15 caliber from Seiko, a reliable 23-jewel movement that efficiently keeps time. A 50-hour power reserve also saves the timepiece from stopping after long periods of not being used. A scratch-resistant synthetic sapphire crystal protects the timepiece. If you love going out with friends and want to have that sleek and elegant-looking timepiece, then the Seiko SARB035 is perfect for you. This timepiece is an excellent dress watch that can be used on any informal and formal events. It also fits most outfits as it dons a silver and creamy white color tone. Being under $500, it is also quite the bargain for such a functional and luxurious-looking timepiece. Hamilton, a brand known for its unique American history and enduring quality, pays tribute to military timepieces with the Hamilton Khaki King. This rugged and durable timepiece exudes strength with this homage to its predecessors. Designed for strength and dressiness, it is a great timepiece to have. The design of the Khaki King is very masculine and elegant at the same time. It sports a rugged look with its band, design, and size, all catering well to its target users. A brown leather band is the first thing you might notice and it exudes a rugged look to its stitched façade. The watch itself shows a unique dial layout and shows a seemingly simple, yet eye-catching design. It is a timepiece that caters to the allure of ruggedness and adventure. The size of the watch leans on the larger side at 40mm, not too big but definitely not small for most men. Its case features a non-reflective sapphire crystal that is scratch-resistant and capable of being taken on outdoor trips. It also has an exhibition caseback so you can see the interiors of the timepiece. Hamilton is also proud of its Swiss-made movements. It is powered by the ETA Cal. 2834-2, a 25-jewel movement that ensures greater accuracy especially when you need it on long days of travel. 38 hours of power reserve also ensures it won’t need too much attention before running out of juice. A day/date function is also available at the 12 o’clock mark, making it a unique yet surprisingly attractive addition to the dial of the watch. It also has 50m water resistance, not really for water sports but just enough so you won’t have to worry too much on getting it wet for a bit. If you like timepieces that are flexible depending on the type of activity or event you would be going to, then this is a reliable partner for you. The Hamilton Men’s Khaki King H64455533 is capable of dressing up or down depending on the occasion. It exudes a manly look, thanks to its military history, and is very fitting for the modern working man. It fits most outfits and is definitely a good catch for under $500. Marathon is a watch company that has produced quality timepieces since 1939. They have also produced tough military watches for the US Army in the 1980s, showing its testament to durability and functionality. Currently, it still produces quality Swiss timepieces seen through the WW194003. The size of the WW194003 Field Watch leans on to the smaller side of wrist sizes. It maximizes this with the movement of the hands when travelling, making it less of a burden that a larger-sized watch can make. A strong sapphire crystal also protects the dial in case it gets hit by any obstacle when travelling. The design is simple and utilitarian in nature but has its own charm attached to it. This particular look is specifically meant for use in field operations, or on outdoor expeditions for the modern adventurer. The simple and charming gray case is actually made up of high-impact fiber shell, ensuring extreme durability for travelling while being lightweight as well. It features a 24-hour dial, a reference to military timepieces. The 24-jewel movement from its NH35 caliber also ensures that it provides an accurate reading. It utilizes dual-winding movement, making the watch woundable through both manual winding and through the automatic motor. Tritium tubes are also utilized at the hands of the watch, an illumination innovation that does not need charging or an external light source for its power. 50m water resistance also allows light resistance against water so that any accidental dips won’t affect its interiors. Marathon has provided a strong, simple, yet charming timepiece that any adventurer can wear. Costing less than $500, the WW194003 is definitely a great deal for its features. It maximizes its proficiency as a field watch with a straight-forward design, and is the ideal choice for the modern-day explorer. It is functional and tough, ensuring that any outdoor event is covered without worrying about damaging it. The advent of automatic watches has significantly reduced the amount of battery waste and the burden of battery replacement once in a while. While this type of watches can offer a myriad of functions and features, it can come with a bank-breaking cost too. How to find a good automatic watch that is affordable? Here are some tips. Yes, whenever choosing something, start with things you love. Scroll down some pages to pick some features that you like. It seems very detailed, but the more precisely you go the more vividly you could picture your desired watch. One tends to overlook these elements, but trust me, you need to go through this step. Why? You don’t want to buy a watch that you only wear a few times, right? If you’re going to buy a watch that stands through time test, be detailed. The next important thing is the size of your wrist. Now you have a few features that you would love to go for, but don’t forget to buy a watch that fits your wrist. Recently, big watches are on the trend now. One could be as big as 46 mm excluding crown. No matter how big the watch you want to buy, choosing one that fits your wrist is essential. Nowadays, watches aren’t just a device to tell time anymore. With innovation and technology, watchmakers can create watches with many functions. Keep in mind that watches packed with functions could be expensive. Affordable watches will only feature some of these functions, so think before you buy. Last but not least, count your money. See how much you can afford the watch of your dream. Some people buy watches to impress others, but I don’t agree. You can always buy a good, wallet-friendly watch that looks appealing as well. Both quartz and automatic watches have pros and cons. Some people find quartz is more comfortable; others prefer automatic. So which is the better option for you? With the automatic watch, you don’t have to wind it manually. Using a rotor that converts the movement of your wrist to energy, the watch stays healthy as long as you move your hand. Automatic watches offer nice and smooth movement without compromising the sophistication of craftsmanship. What are the cons? Same as mechanical watches, automatic ones are sensitive to the environment too. Since you can’t wind the watch by hand, you need to buy extra a watch winder for the task. That’s why automatic watches can sometimes be costly. Quartz movement is well-known for accuracy and affordability. Quartz watches are powered by a small battery, which vibrates 32,768 times a second. One of the advantages of quartz watches is its accuracy. It will never lose or add seconds at any time of the day. Though using batteries, watches with a quartz movement don’t require regular maintenance. You may need to change the battery once a year or so. Besides, quartz watches are durable and super affordable. You can find quartz models as cheap as $15. The cons? The movement isn’t as smooth as automatic ones. Quartz movement doesn’t have the elegance, technical craftsmanship or history to start with. So if you favor sophistication over affordability, automatic watches are the best choice. If you stay on a tight budget, nothing is better than the quartz movement. In term of accuracy, automatic watches aren’t perfect. The general rule of thumb is you need to add or minus 25 seconds per day. Every two day, the watch will gain or lose that amount of seconds. This is a consistent accuracy that automatic watches have. It is safe to say that automatic watches are reasonably accurate. With only 0.03% of inaccuracy, we still can depend on them 99.97%. For those who seek the ultimate accuracy (divers for example), quartz or chronometer watch would be more suitable. 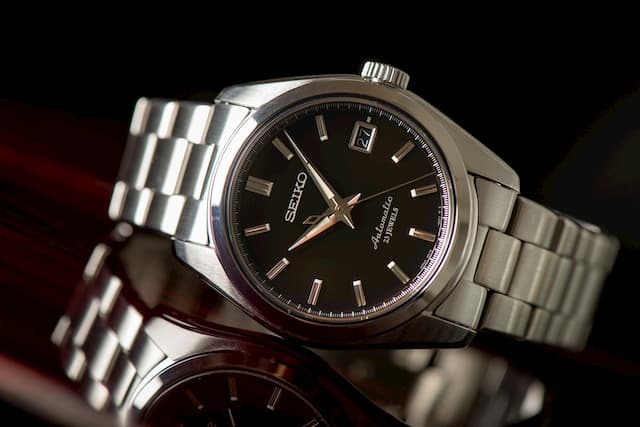 Seiko in Japanese means “exquisite,” which is precisely what this watchmaker has been aiming for. For over 100 years, Seiko has built its reputation for making high-quality and affordable watches. Automatic watches from Seiko adopt Kinetic movement. Kinetics are well-known for their smooth function. Only by moving your wrist from time to time, you can keep your watch up and running for an extended time. No maintenance required. I have been a massive fan of Seiko automatic watches for years and haven’t found anything to complain. Automatic watches are powered by the wrist movement. That’s why when you stop wearing the watch for 1 or 2 days, it will eventually stop. Automatic watches could make noise when it works since the rotor is moving. However, the noise is too subtle for some people to notice. 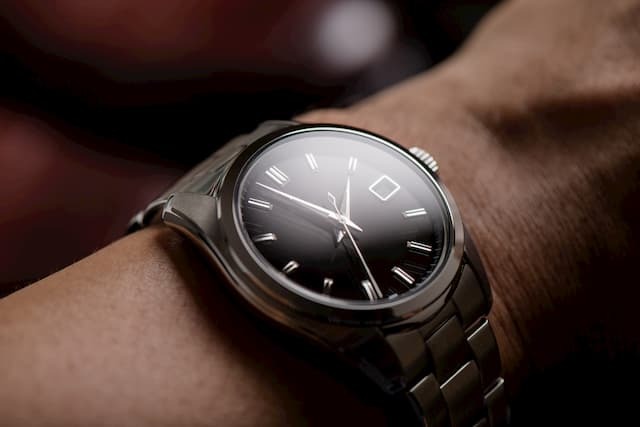 If your automatic watch vibrates too loud, it is time to have it checked. In this list are the best automatic watches under $500 that fits the perfect spot of not being too expensive that only a few can buy them and not being too cheap that the quality suffers instead. This also reflects most of the categories people choose from when buying timepieces. Some of which are dive watches, dress watches, and outdoor watches. They all hail from trusted watch brands, ensuring that any of these is definitely the smart choice that you can proudly wear without shelling out too much just for their name.